Computer Vision - the health of your eyes is our first priority! Unfortunately, eye problems associated with this activity are also on the rise. Even if you have never had any eye problems before, you may have noticed computer vision syndrome symptoms after two or more hours of screen time. Even if your symptoms are mild, they can worsen and cause other vision problems if not addressed. 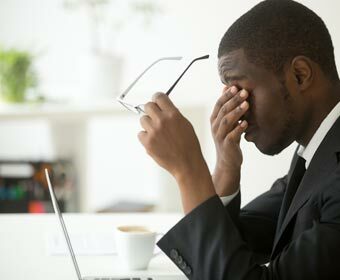 There are a number of factors that determine the amount of strain your body feels as you work on a computer or other digital device, including lighting in the room, distance from the screen, glare on the screen, seating posture, and the angle of your head and/or any existing vision problems you may have. One or all of these may combine to cause an uncomfortable amount of strain on your eyes. Depending on your age, health and occupation, it is recommended that a comprehensive eye examination every 1-2 years. The severity and length of computer vision syndrome symptoms depends on how long you stare at the computer, your posture, lighting, glare, the angle of the monitor, and whether or not you have other diagnosed or undiagnosed vision problems. 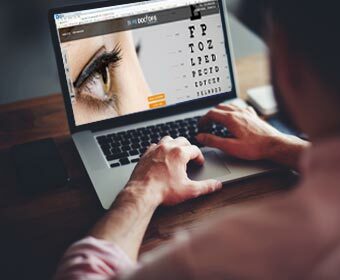 If you already suffer from astigmatism, farsightedness, presbyopia, aging eyes, and/or diabetic eye problems, your computer vision symptoms may worsen. This can even be the case if you already wear prescription eyeglasses or contacts. Many regular contact lenses and eyeglasses, and even sunglasses are not designed to deflect the problems caused by computer screens. More computer friendly prescriptions are available. For people with otherwise normal eyes and vision, a set of specially-designed glasses used during the time you spend on a computer or screen can be very helpful. Adjust your monitor so that it is about 15-20 degrees lower than your eye level when seated between 20-28 inches away from the screen. Also, invest in an anti-glare screen for your monitor to help reduce glare from surrounding lights. Be sure to sit and work with proper posture. Every 20 minutes during your work, look away toward a distant point for 20 seconds to refocus your eyes, and give them a 15 minute break after each 2 hour computer session. Also remember to blink more frequently to keep your eyes moist. With a combination of the proper optometry care and self-care, you can minimize computer vision syndrome symptoms and other modern day vision problems. Contact us for an appointment today.